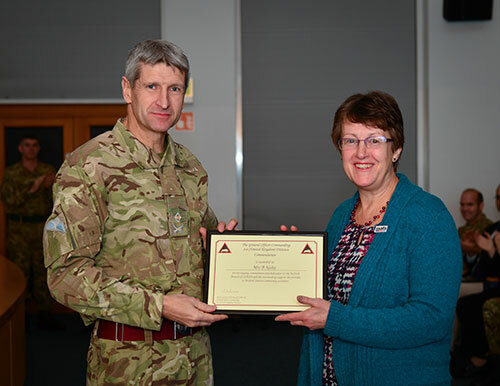 SSAFA volunteer Bridgette Nulty, 67, has received a Commendation from General Officer Commanding (GOC) 1(UK) Division, British Forces Germany. Major General James Chiswell CBE MC presented Bridgette with her award in recognition of her commitment and support to the local military community in Bielefeld in Germany. Bridgette has been a volunteer for almost three years, where she has been the driving force behind various annual fundraising events such as the SSAFA Big Brew Up, Military Wives Choir evening and the very successful Herford Station Christmas Fair. Bridgette said: “I was delighted, and immensely proud, to receive the GOC’s commendation for the work I have done organising fund-raising events for SSAFA here in Herford Station. “I believe that volunteers are the ‘glue’ that holds the military community together, and as Herford Station moves towards closure in summer 2015, our role becomes ever more important.